1.1 The name of the COMMUNITY COUNCIL shall be FORTROSE AND ROSEMARKIE COMMUNITY COUNCIL (referred to as "the COMMUNITY COUNCIL" in this document). 2.1 The area of the COMMUNITY COUNCIL shall be as shown on the map for Fortrose and Rosemarkie Community Council attached to The Highland Council's Scheme for the Establishment of Community Councils, a copy of which is attached hereto. e) to be a means whereby the people of the area shall be able to voice their opinions on any matter affecting their lives, their welfare, their environment, its development and amenity. In the discharge of their functions and the conduct of their business, the COMMUNITY COUNCIL and its members shall have regard to their role and responsibilities as set out in section 3 of the Scheme for the Establishment of Community Councils, approved by The Highland Council and the Community Councillors' Code of Conduct, hereinafter referred to as `the Scheme' and `the Code of Conduct' respectively. The Community Council has a specific role as a statutory consultee on planning applications and on objections to liquor licences. 5.1 The COMMUNITY COUNCIL has Nine (9) members as governed by section 5 of the Scheme and set out in Appendix 2 of the Scheme. 6.1 Election procedures shall be governed by the method of election laid down in section 6 of the Scheme. a) fill the vacancy by co-option with voting rights to a maximum of one third of the total membership of the Community Council taking into account the exclusion of co-opted members from this process as outlined in section 8 below. b) fill the vacancies by undertaking a postal ballot as per standard election procedure set out in section 6 of the Scheme for the Establishment of Community Councils. Any interim election however, other than when the number of Community Councillors falls below the minimum level specified, will be administered by the Community Council. Should attempts a) and b) fail to fill the vacancy, the vacancy can be left unfilled until local public interest is expressed or until the next set of regular elections. 8.1 The right to vote at any meeting of the COMMUNITY COUNCIL or any committee thereof, shall be held by all COMMUNITY COUNCILLORS whether elected or co-opted, but not by Associate , or Ex-officio members. For the avoidance of doubt, co-opted members while otherwise holding full voting rights will not be entitled to vote on co­option of members. all decisions of the COMMUNITY COUNCIL will be decided by a simple majority of those eligible to vote and present and voting. 8.3 In the event of a vote of the Community Councillors that results in a tie, the chairperson of the meeting shall have a second and casting vote, and the use of a casting vote will be recorded in the minute of the meeting. 9.1 At the first meeting of the COMMUNITY COUNCIL after elections in the year when elections are held and at the Annual General Meeting in any year when elections are not held, the COMMUNITY COUNCIL shall elect a Chair, Secretary, Treasurer and other such office-bearers as it shall from time to time decide. In addition to the above, the Community Council may appoint a person, not a member and not eligible to be a member of the Community Council, as a minute Secretary. However, such individuals shall have no voting rights. 9.2 All office-bearers shall be elected for one year, but shall be eligible for re-election annually. 9.3 Without the express approval of The Highland Council, no one member shall hold more than one of the following offices at any one time: Chairperson, Secretary, Treasurer. 10.1 The COMMUNITY COUNCIL may establish sub-committees and appoint Community Councillors and associate members to serve on these committees. The COMMUNITY COUNCIL shall determine the composition, terms of reference, duration, duties and powers of any sub-committee. While a person or persons not members and not eligible to be members of the Community Council may be appointed as having special expertise relevant to the purposes of the committee, such external member shall not have voting rights. 11.1 a) The quorum for COMMUNITY COUNCIL meetings shall be 4 voting members. b) Once in each year, before the 30th June, the COMMUNITY COUNCIL shall convene an annual general meeting for the purpose of receiving and considering the Chairperson's annual report on the COMMUNITY COUNCIL, the submission and approval of the independently examined annual financial statement and the appointment of office bearers. c) In addition to the annual general meeting, the COMMUNITY COUNCIL shall hold not less than 6 ordinary meeting throughout the year. d) Dates, times and venues of regular meetings ©f the COMMUNITY COUNCIL shall be provisionally fixed at the first meeting of the COMMUNITY COUNCIL following ordinary elections and thereafter at its annual general meeting. Special meetings shall require at least 7 days public notice, either called by the Chairperson, or on the written request of not less than one-half of the total number of COMMUNITY COUNCILLORS. e) Copies of all minutes of meetings of the COMMUNITY COUNCIL and of committees thereof shall be approved at the next prescribed meeting of the COMMUNITY COUNCIL (excluding minutes of the Annual General Meeting), but the draft minute shall be circulated normally within 14 days from the date of that meeting, to COMMUNITY COUNCIL members and Highland Council's named officer for the COMMUNITY COUNCIL. f)The COMMUNITY COUNCIL shall abide by the Standing Orders for the proper conduct of its meetings. Individual Community Councillors shall abide by the Code of Conduct for Community Councillors set out in Appendix 5 of the Scheme. either at its previous meeting or immediately prior to the item being taken. The reason to meet in private must be recorded in the minutes of the meeting at which the decision to take the matter in private was made. If a decision to take an item in private is made at the previous meeting of the Community Council, the notice of such a meeting, given to the public in the usual way; will record that an item or items are to be taken in private. Minutes of the discussion and decisions shall be taken and recorded in a manner which does not compromise the private material. 12.1 a) All meetings of the COMMUNITY COUNCIL and its committees (subject to 11.1 (h), above) shall be open to members of the public. Every effort should be made to ensure proper accessible provision for the accommodation of members of the public. b) The opportunity should be afforded at each meeting to permit members of the public to address the COMMUNITY COUNCIL, under the guidance of the Chairperson. c) Notices calling meetings of the COMMUNITY COUNCIL and its committees shall be posted prominently within the COMMUNITY COUNCIL area, and on its website where appropriate, for a minimum period of 7 days before the date of any such meeting, and, where possible, be advertised by other suitable means. and any other such suitable information, as may from time to time be agreed between the COMMUNITY COUNCIL and The Highland Council. When special meetings of the COMMUNITY COUNCIL are to be held, the named Highland Council officer should be advised of the date, time venue and subject(s) of debate of such meetings, at least 7 days in advance of the meeting date. 14.1 a} All monies raised by or on behalf of the COMMUNITY COUNCIL or provided by The Highland Council and other sources shall be applied to further the objectives of the COMMUNITY COUNCIL and for no other purpose. The monies provided by The Highland Council in the annual Administrative Grant for administrative and other approved purposes shall be used only as prescribed in the conditions of grant. Funds raised from other sources may be used in accordance with the terms of those funds (so long as they are consistent with the objectives of the Community Council), or in the absence of such terms, for the furtherance of the objectives of the COMMUNITY COUNCIL. .
b) The COMMUNITY COUNCIL shall open a bank account in the name of the Community Council. c) The Treasurer shall undertake to maintain proper financial records of the finances of the Community Council as per the standard financial templates provided. d) Any two of three authorised signatories, who would normally be office-bearers of the Community Council, must authorise by signature financial transactions on behalf of the COMMUNITY COUNCIL. Authorised signatories may not be members of the same household. e) A financial report, in the style set out in Appendix 6, shall be submitted to an annual general;, meeting of the COMMUNITY COUNCIL for the preceding financial year, being circulated with the agenda for that meeting and shall be available for inspection at a convenient location 7 days prior to the meeting. The report shall be independently examined and certified by at least one examiner appointed by the COMMUNITY COUNCIL, who is not a member of the COMMUNITY COUNCIL and has no personal or professional relationship with the Treasurer. f)The financial year of the COMMUNITY COUNCIL shall be from 1st April each year until 31st March the succeeding year. The certified financial statement are received and approved by the COMMUNITY COUNCIL at the annual general meeting shall be submitted to the named Highland Council officer following approval at the Community Council's annual general meeting. 15.1 Property and other assets belonging to the COMMUNITY COUNCIL shall be vested in the Chair, Secretary and Treasurer of the COMMUNITY COUNCIL and their successors in these respective offices as Trustees of the Community Council. Any proposal by the COMMUNITY COUNCIL to after this Constitution must be first considered by a special meeting of the COMMUNITY COUNCIL and the terms of the proposal to alter the Constitution shall be stated on the notice calling the meeting, which shall be published not less than ten days prior to the meeting. Any proposed alterations may not prejudice the terms and objectives contained within the Scheme. 16.2 If the proposal is supported by two-thirds of the `total voting membership of the COMMUNITY COUNCIL, and is subsequently approved in writing by The Highland Council, the alteration shall be deemed to have been duly authorised and can then come into immediate effect. For the avoidance of doubt unless and until the proposed alteration is approved in writing by The Highland Council, the proposed alteration shall be of no effect. 17.1 If the COMMUNITY COUNCIL by a two-thirds majority of the total voting membership decides at any time that it is necessary or advisable to dissolve, it shall agree a date for a public meeting to be held to discuss the proposed resolution to dissolve. Not less than ten days prior to the date of such a meeting a public notice will be published in the Community Council area giving intention of the proposal to dissolve. 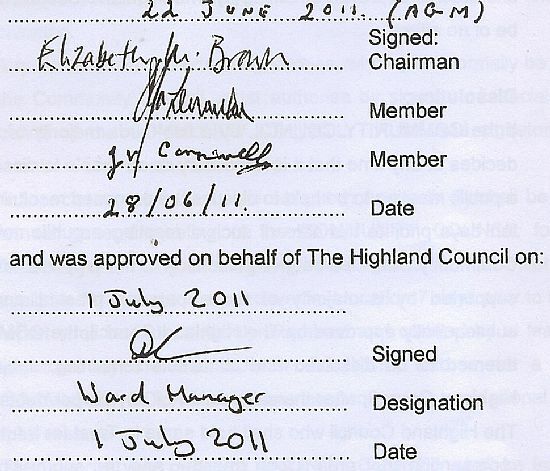 If the resolution is supported by a majority of those persons present and qualified to vote and is subsequently approved by The Highland Council, the COMMUNITY COUNCIL shall be deemed to be dissolved and all assets remaining, subject to the approval of The Highland Council, after the satisfaction of any proper debts or liabilities shall transfer to The Highland Council who shall hold same in Trust for a future COMMUNITY COUNCIL representing that area. Upon transfer, and the submission of a satisfactory certified financial report, the potential liabilities of members and officers of the former Community Council are extinguished. 17.2 In the event that the COMMUNITY COUNCIL is dissolved under the above procedure, and twenty or more electors subsequently wish the re-establishment of a COMMUNITY COUNCIL for the area, these electors shall submit a requisition to The Highland Council in accordance with Section 52(7) of the Local Government (Scotland) Act 1973, on receipt of which the Returning Officer shall arrange for elections to be held in accordance with this Scheme. Constitution of the COMMUNITY COUNCIL, cause the COMMUNITY COUNCIL to be dissolved and in this event, the procedures for the establishment of a new COMMUNITY COUNCIL in 17.2, shall apply for the establishment of a new Community Council.